Lovebirds mate for life. These stunning jade and ruby crystal earrings were specially carved as an homage to this concept, and feature two birds who are gazing lovingly at one another with glittering diamond eyes. Not only does the intricate carving highlight the incredible natural melding of ruby crystal and jade into one stone, it celebrates the jade in the most elegant way possible. Jade has long thought to have a sweet, nourishing purity that accompanies it, and it is believed to bring these qualities to the wearer. Accenting these gorgeous stones are swirls of diamonds set to look like unfurling tail feathers. The final touch to these earrings is the ruby crystal set in a diamond “circle of life” halo. This represents the ultimate cycles of mother nature, with her consistent rebirth. 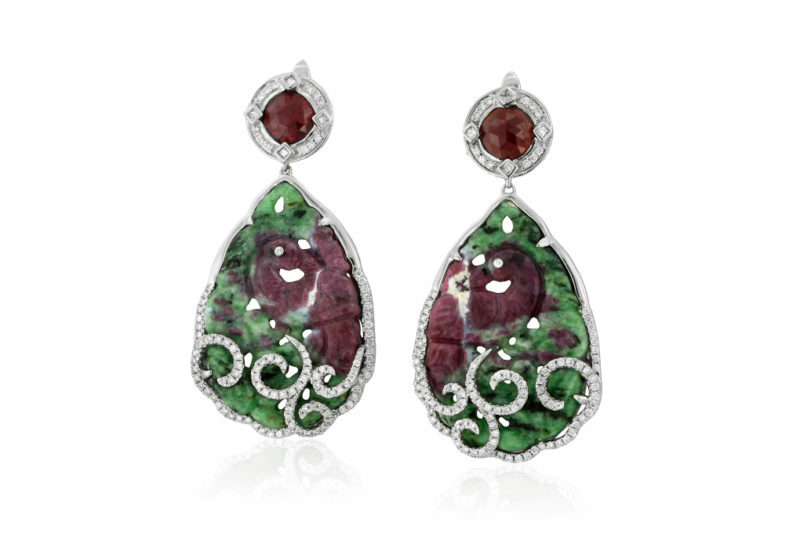 These earrings are not only works of art, but a truly decadent representation of the fascinating beauty of nature.